an area of social studies which studies and measures how people make choices to satisfy unlimited wants and needs with the limited resources available to them. There are three levels of economics, namely: macroeconomics, microeconomics, and home economics. The science of economics combines and uses many other social studies. One of the most difficult things about learning a new language, especially once you’ve gotten the basics, is keeping up with so many random phrases, idioms, and expressions. This is hard not only because very few seem to be very logical, but also because they’re constantly changing. Expressions die out, and new ones fall into common usage all the time. When you learn idioms straight from the textbook, you might find it frustrating to find out that some of the sayings you worked so hard to memorize are only really used by people in their ‘50s and up. When it comes to money, however, it doesn’t hurt to throw a few expressions into your toolbox, just because there are so many out there. Money really does make the world go ‘round, and language is a great reflection of this. For example, even the word “money” has many synonyms, both formal and colloquial, each with their own slight nuances. 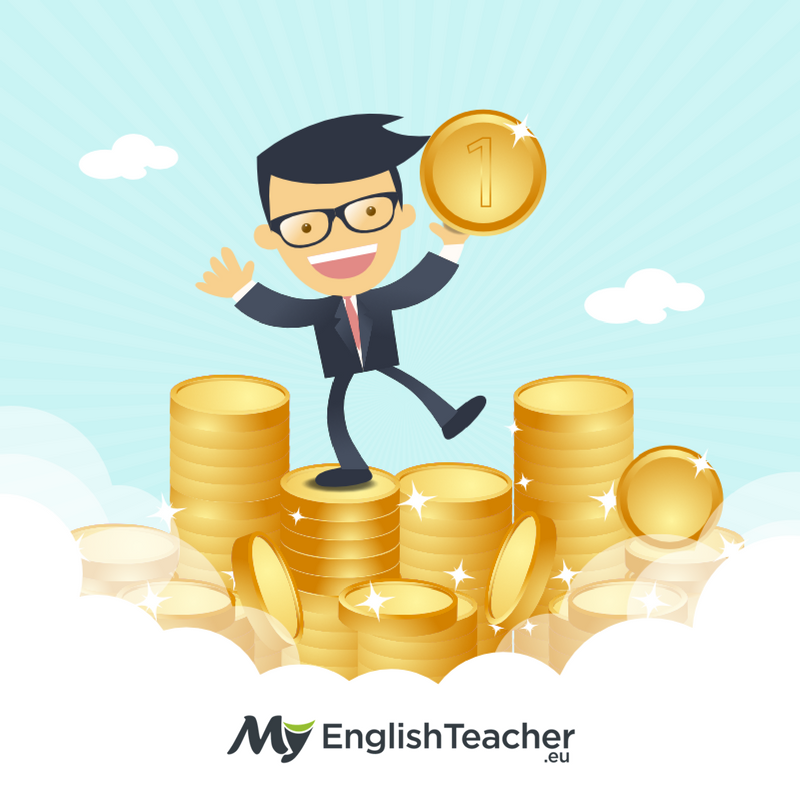 So, here is a compiled list of several English terms, phrases, and idioms that you might find helpful in the world of money. I tried to include mostly expressions that I find common as an English speaker. Usually, the first thing we learn in Economics 101 is supply and demand. So to help you I have created a short list of the most important terms used in basic economics with explanations and example sentences. a study focusing on individual consumers and organizations, their needs and wants, and the choices they make in regards to fulfilling these needs and wants with the scarce resources available to them. How we choose to spend our time and money are microeconomic choices. a resource is anything of value to us that we can use in the production (to make) of a good or service. Examples of resources include natural resources like water, wheat, and rice. Time, human labor, money, and machinery are also resources. Most people do not have the resources to live like Bill Gates. in regular conversation, scarcity means not having enough of something. In economics scarcity, or having “scarce resources”, means to have a limited amount of the resource. Even the richest man in the world’s resources are limited to a certain degree. Economics is a study of how people satisfy their unlimited desires with scarce resources. products, materials and any other physical things which can be bought, traded, or sold to individual consumers, or organizations. Examples: food items, phones, computers, furniture, stationary, clothes, and toys. Department stores like Walmart or Target have thousands of goods for consumers. actions or work activities performed by one person, or organization that is provided for payment from a customer for the service. Examples include: getting a haircut, an accountant doing taxes, English lessons with a tutor. MyEnglishTeacher.eu provides various services depending on the student’s needs. When you spend lots of money at the hairdressers, you expect excellent service. consume means to use up, drink, or eat. People who personally buy or use a product or service are called consumers. The first step to marketing is knowing who your product’s end consumer is. in regular conversation, demand means to ask strongly for something, as if it is your right to have it. In economics, demand refers to the quantity of a good or service consumers would like to buy at a certain price, during a particular period. Demand for headphones has gone up with the popularity of the iPhone and other smartphones. a graph showing the relationship between the quantity of a goods or services that consumers want, and its price per unit. The horizontal axis illustrates the amount consumers will buy, and the vertical axis shows the different possible prices of the good or service. We can see from the product’s Demand Curve that we will sell more units if we lower the price. Looking at the demand curve you can easily tell the price of a beer. The concept that people are normally willing to buy less of a product if the price is high and more of a product if the price is low. The fact that when a good or service’s price increases, it causes a decrease in the quantity demanded by consumers. It works the other way too. When the price of a good or service falls, the quantity demanded increases. If the price of milk drops, we can expect – according to the Law of Demand -, that milk sales will increase. the amount a market’s demand for a product changes in relation to changes in its price. Some products are more sensitive to price movements, where sales change drastically after any change in price. These are said to have high elasticity. Wine has a high elasticity of demand. When wine prices rise, the demand for wine drops significantly. factors other than money which create changes in a good’s demand or supply. Examples: Changes in market size, a target group’s income levels, changes in the market’s tastes. There are many determinants of demand to keep in mind when marketing a good or service. the number of goods and services that producers want to, and are capable of, providing to consumers at different prices, during a particular period. The supply of rice has seen an increase in recent years, as farmers take advantage of the rise in rice prices. an individual or organization that makes or provides goods and services to fulfill consumers’ needs and desires. Examples: Nike produces shoes, Apple produces consumer electronics. The producers of the widely popular Angry Birds app have produced a range of toys based on the app’s characters. a graph showing the relationship between the quantity of a good or service desired by consumers and its price. The horizontal axis will most commonly show a quantity, whereas the vertical axis will have different price points. As we can see from the supply curve below, the producers will supply 100 units of their product if it is priced at $100. the fact that producers will provide higher quantities of a good or service at higher prices than lower prices. This is because they are often able to make more money when their products or services can be priced at higher prices. We know according to the Law of Supply that oil companies will produce more barrels of oil when prices are high than when they are low. how much any change in the price of a good or service affects the amounts producers supply. The higher the elasticity, the greater the change in supply per dollar increase or decrease in price. Diamonds have a high elasticity of supply. When the market price rises, diamond mining increases, to take advantage of the higher possible profits gained. I love the utility of the new soap. Yes, you can always use butter as a substitute for margarine. This is the time to stock up the store, the market is at Equilibrium. Buying this building is a big asset to your business. There are a lot of words that mean the same thing as “money,” but “cash” is a pretty common one. It’s also useful in that it specifically refers to physical money, like paper and coins, as opposed to money represented electronically. Often, you might hear a cashier ask you if you’re using “cash or card” to pay for something. Or you might see a store sign saying “cash only” if they only accept physical money. This word is slang and also means “money,” but you’ll hear it here and there. Not everyone uses it, and some say the word just to be funny, but in case you hear someone ask, “Are you making any dough?” you’ll understand what they’re saying. At least in the U.S., the word “buck” is synonymous with “dollar.” It’s slightly informal, but pretty much every American uses and understands it. If something is worth five bucks, it’s five dollars. Pretty simple. Also spelled “moolah,” this word is also slang for “money,” and if you use it, you might get even more laughs than if you use the word “dough.” I’m not really sure where this word comes from, and to be honest, I’m not sure if anyone does. You can google “moola etymology” and see what comes up. “Grand” is a fairly useful word, and when used in the context of money, it means “a thousand dollars.” So instead of saying you make $3,000 a month, you can say you make “three grand” (you don’t say “grand dollars”). An alternative to this is using the letter “K,” which is especially useful when dealing with much larger numbers. So, $50,000 becomes “50K,” $200,000 becomes “200K,” etc. The reason we use the letter “K” is that it stands for “kilo-,” a prefix that means “thousand.” Think of words like kilogram, kilometer, etc. If you’re “making bank,” then you’re making a lot of money, probably because a “bank” is a place that tends to hold a lot of money. Note that this is a somewhat informal, but common expression. Hopefully you’ll be making bank when you get that next promotion! Picture yourself lying down in a giant pile of cash. Now picture yourself rolling in it. It might be a bit uncomfortable… but quite a privilege right? To be “rolling in money” means, simply, to have a lot of money. Enough to fill a bathtub, maybe. You can also shorten this expression and say that you’re “rolling in it.” People will mostly likely understand you either way. Previously, we saw the word “buck,” which means “dollar.” However, “big bucks” does not mean dollar bills that have been printed oversize. If you’re making “big bucks,” it just means that you’re making a lot of money, so the term usually refers to a large profit of some sort. If you want, you can throw in the word “the” as part of the expression (“He’s making the big bucks”). If somebody is “raking it in,” then that person is making a lot of money. In other words, he or she is making bank—the big bucks. Maybe picture that big pile of money again. Now imagine holding a rake and dragging those dollar bills into your savings account. I’m guessing that’s where the expression came from. If somebody is “loaded,” it might mean that they have guns filled with bullets and ready to fire. Usually though, it means that that person has a lot of money. If you hear that your friend Mike is loaded, you might want to convince him to buy you some free stuff. To “make a living” means to make a salary, or, in other words, to have a steady job. You might hear somebody ask you, “How do you make a living?” or “What do you do to make a living?”. However, it might be even more common to be asked, “What do you do for a living?” which is just another way of asking what your job or occupation is. If you’re a teacher, you might say, “I teach for a living,” which means that teaching is your main source of income. If someone goes “from rags to riches,” then he or she somehow went from being very poor to being very rich. It’s the main tenet of the American Dream and a narrative driven to fame (and cliché) by Horatio Alger in the Gilded Age. In fact, any situation that involves a inspirational climb from poverty to wealth can be described as “rags-to-riches.” For example, My Fair Lady might be considered a rags-to-riches story. When used as an adjective, “broke” is very different from “broken.” When a computer, phone, or any machine is “broken,” it means you can’t use it anymore. But when a person is “broke,” he or she has almost no money. It’s probably one of the most common words used by American college students (“I can’t go to the movies tonight, I’m broke!”). However, you cannot use the word “break,” “broken,” or any other variation of the verb to denote poorness. You can only use “broke” as an adjective. I included this phrase because there are a lot of painters in my family, and I therefore hear the phrase a lot. A “starving artist” is basically a newly emerging artist who doesn’t make a lot of money and spends more on art supplies than basic things like food, shelter, etc. It’s the classic archetype of a young painter trying to sell his or her work on the sidewalk and eating ramen in their one-floor home/studio. I know I’m being cynical, but at least now you know the expression. If you are short on money, then you do not have a lot of money to spend. In other words, you’re on a tight budget. You can also that you’re “short on cash,” “short on dough,” or whatever alternative you can think of. If you’re “getting by,” then you’re making enough money to survive alone in the real world, but it usually doesn’t have a very positive connotation. You can also say that you’re “just getting by” or “barely getting by.” You can even say that you’re “just scraping by”—picture yourself scraping the bottom of your wallet for those last pennies you have. While “filthy rich” means very rich, “dirt poor” means very poor. Maybe there’s something inherently unsanitary about money? Be careful, though, not to say “filthy poor” or “dirt rich.” It only works one way. Difference Between I DON’T HAVE and I HAVE NO! While saying that something is a steal, does not mean you are actually stealing, this phrase does. Despite what it sounds like, the “five finger discount” is not actually a discount. It’s just you using your hand (five fingers) and literally stealing something from the store. If your friend tells that she bought her diamond ring using the five finger discount, you’ll know not to act so innocently. For example, we can say that the price of gas is “soaring” or “skyrocketing,” which just means that it’s really rising. On the other hand, prices can also “drop,” “plummet,” or “plunge,” which mean the same thing as “fall” but more extreme. Here’s another phrase that relates dirtiness to money. If something is dirt cheap, then it is very cheap. Maybe even a steal. On the other hand a ripoff is something that costs much more than it is actually worth. Think of a T-shirt that costs $60. You can also say that you got “ripped off,” maybe when you decided to buy that T-shirt. Another person can also rip you off if they convince you to pay an unreasonable high price for one of their products. If you hear that your friend Dan is a cheapskate, you might not want him to take you out to dinner. This is because a cheapskate is someone who doesn’t like to spend a lot of money. In other words, a cheapskate is very cheap (stingy). You might not want to be called that on a first date. This phrase is typically used in restaurants. If something is “on the house,” it’s free and paid for by the restaurant. For example, let’s say you know someone who works at your favorite bar. Everytime you go there, your friend might give you some drinks on the house. Just as something “on the house” is paid for by the management, something “on you” is paid by… you. You might say, “Drinks on me!” if you want to be extra nice to your friends, because it means that you’re paying for all of your friends’ expenses. If something is “duty-free,” then you don’t have to pay taxes with it (“duty” means “tax”). You often find duty-free stores in airports or the entire state of Delaware. If you find a place where goods are duty free, get excited knowing that when you buy something, you’ll be making zero contributions to the federal government. If you say that you have money “burning a hole in your pocket,” then that means you really want to spend that money. It’s the thermodynamic law of money… right? I’ve also heard people say that money is burning a hole in their wallet. You can also say that you have “money to burn,” which just means money available to spend.